This Thursday brings us a Wine & Dine Wednesday. Made this last night and just had to share. In my mind a big sheet pan is a cooks best friend. I use one or more almost every time I cook. They have incredible versatility. For this, I cooked the entire meal on one pan, so it made cleanup super easy. Plus it made cooking it all super easy. Oven to my loved 400 to preheat while you get things ready. Dry skin on, bone in chicken thighs and drumsticks with a paper towel. Place on pan, drizzle with extra virgin olive oil, then salt & pepper bowl sides. Citrus is looking amazing at the moment so I cut in half satsumas and whatever other oranges looked good in our bin. Place those on the sheet pan. Then cut medium sized potatoes in half. Along with good sized cauliflower florets. The idea with both is that they are not small as they will cook for an hour at high heat. Add both to the pan nesting all together with the chicken and oranges. Give a generous amount of EVOO to the potatoes, cauliflower and oranges. Along with a bunch of pinches of salt. Lastly, take off a bunch of thyme leaves and let it rain over the whole lot. Then add fresh stems here and there. Thyme is such a hearty herb with a delicate flavor. Almost there! In a bowl juice 2 oranges. Add a teaspoon of honey for each piece of chicken. Put in microwave for 20 seconds to get the honey nice and loose. Stir. Spoon over the chicken pieces. It is now ready for the oven. Every 15 minutes turn, flip or move around everything on the pan. At the half hour point turn the pan completely around so things get equal time at the back of the oven. At the 45 minute mark check the chicken temp. You want internal to be 160. If things look nice and caramelized, pull out. If not, go to the hour mark. Enjoy! 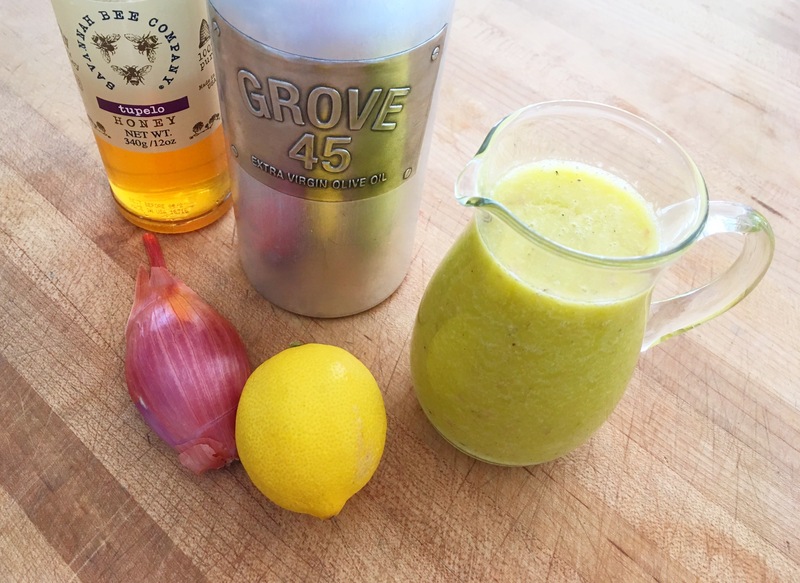 Shallots really bump up the flavor quotient in most things. In vinaigrette they really shine. In this version, they are pulsed in a food processor, so they become super mellow and a sweet top note to the lemon. The food processor breaks them down so you are getting their essence but not full pieces, which can often be a little intense. Could not be easier. In the bowl of a food processor add 1 medium sized shallot, chopped up a bit. A 1/4 of a cup of freshly squeezed lemon juice. 3/4 of a cup of extra virgin olive oil. 1 tablespoon of Dijon mustard. 1 tablespoon of honey. Plus a really healthy pinch of pepper and twice that of salt. Lid on. Pulse. Pulse some more. The shallot should be completely broken down and fully incorporated in the liquids. Have a taste and add more salt & pepper if you think it needs it. Done. Enjoy with whatever greens you like best. The remainder is fab stored in the fridge for your next salad. Add a sprinkling of Parmesan to it the second usage for a little added twist. 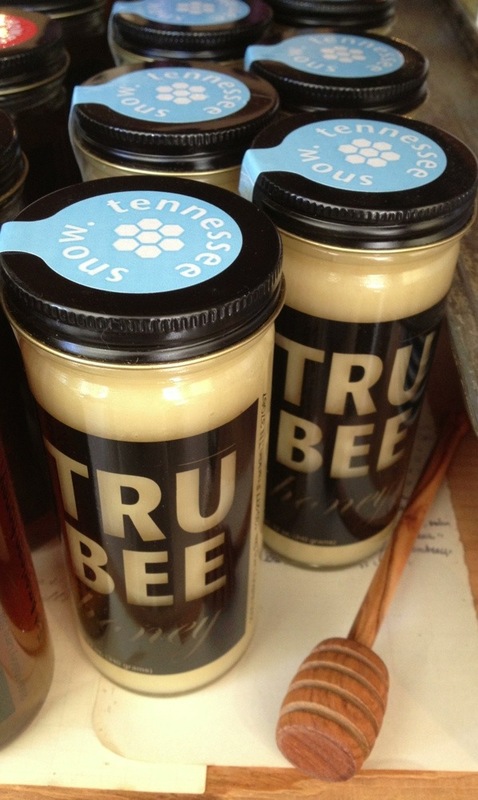 Just In, bottles of the always delightful and tasty TruBee honey, in Spring Coastal & Summer Wildflower. 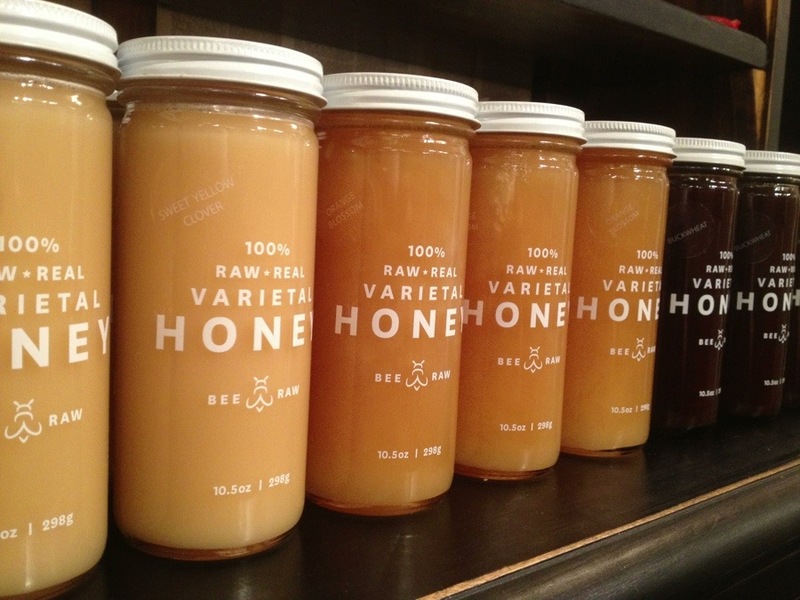 The honeys capture the essence of a particular region and season. Instead of confining the bees to a single-source diet, their “free-range” bees are in places where they can forage tulip poplar, fruit blossoms and black locust in the spring, then feast on wildflowers, herbs and clover in the summer. 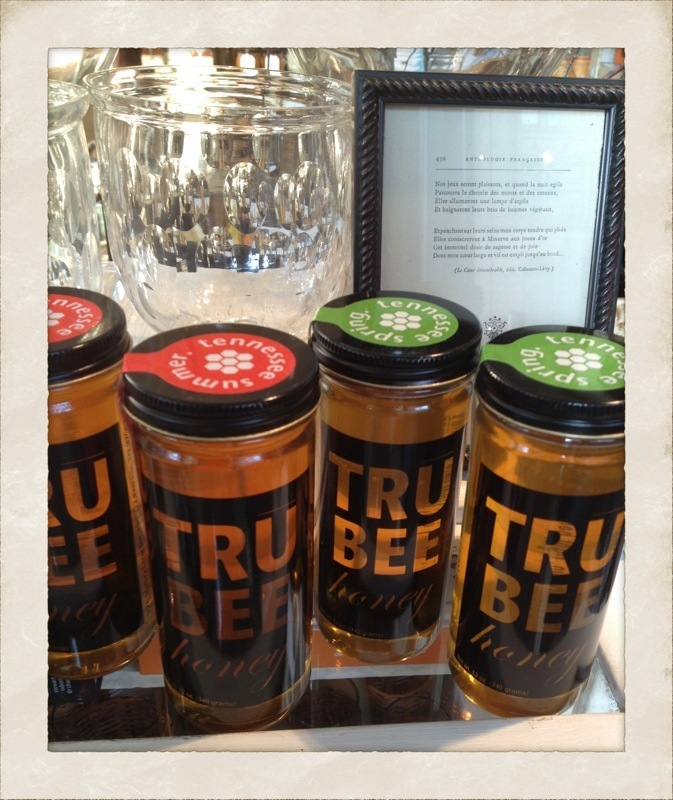 Each jar of TruBee honey captures the taste of nature in a particular place and time. Given the changes in rainfall, sunshine and bloom time, the unique taste of each particular harvest may never be repeated again. A dollop of honey can transform a simple piece of toast or an English muffin, as well as a cup of tea on these chilly Wintery days. Burrata seems to be the ‘IT’ cheese of the moment. When in New York on this last trip, it was on every menu. A creamier version of mozzarella, it works really swell in salads of many variations. This composed Summery salad works well solo or served with the main course. We served tuna last evening and this was perfect right alongside it for a sweet/savory combo. Don’t blink or you will miss how easy this is. Slice red onions paper thin, put in a bowl and cover them with rice wine vinegar. This takes the bite out of the onions and really makes them sort of sweet. Take the skin off of nectarines and peaches and cut into wedges. Scatter onto a platter. 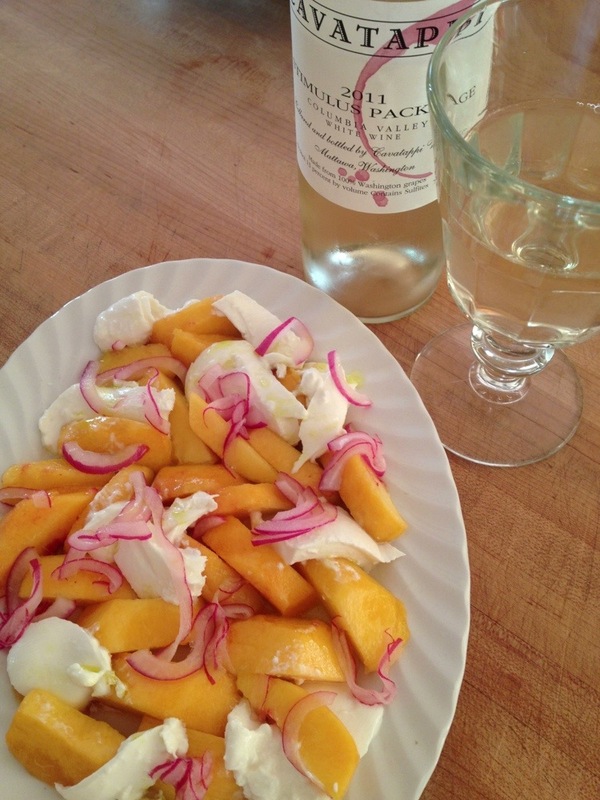 Cut up burrata and lay amongst the fruit. In a bowl, whip up a bit of rice wine vinegar, a dollop of honey and extra virgin olive oil. Pour this over the fruit and cheese. Then take the onions out of the bowl that have been sitting in the rice wine vinegar and scatter about the top of everything. It is very hard not to consume this entire platter by yourself it is so good. But your guests will be happy you shared. 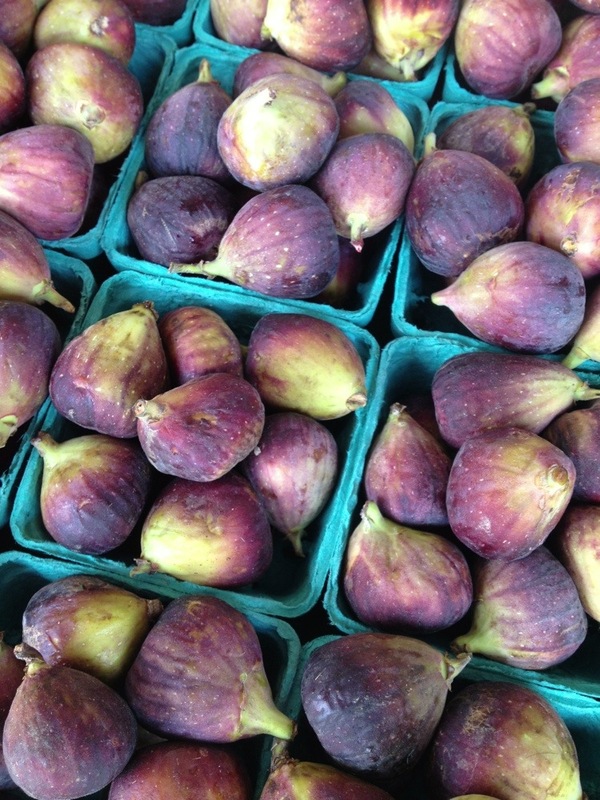 The figs are starting to look really luscious and I saw plenty of sweet options yesterday on my Saturday stroll. Figs are so lovely on their own so you really don’t need to do much with or to them to enjoy. But a little of the best quality honey you can get your hands on is always a welcome addition. 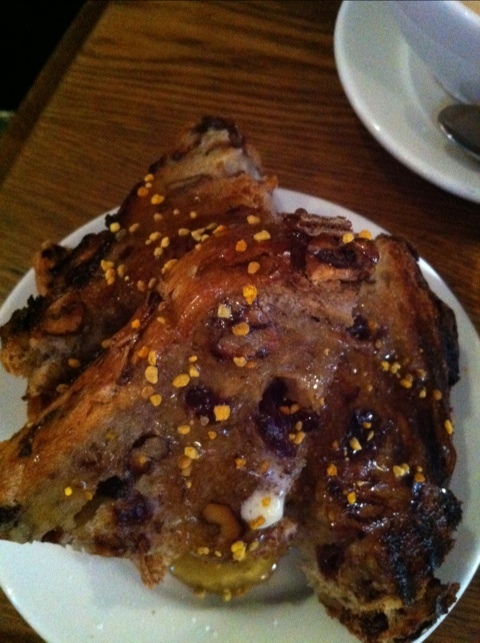 The honey adds to the sweetness. Perfect with a piece of cheese while having cocktails before dinner. The simplest dessert ‘as is’ after a heavy meal or when you just want to serve a little something for dessert. 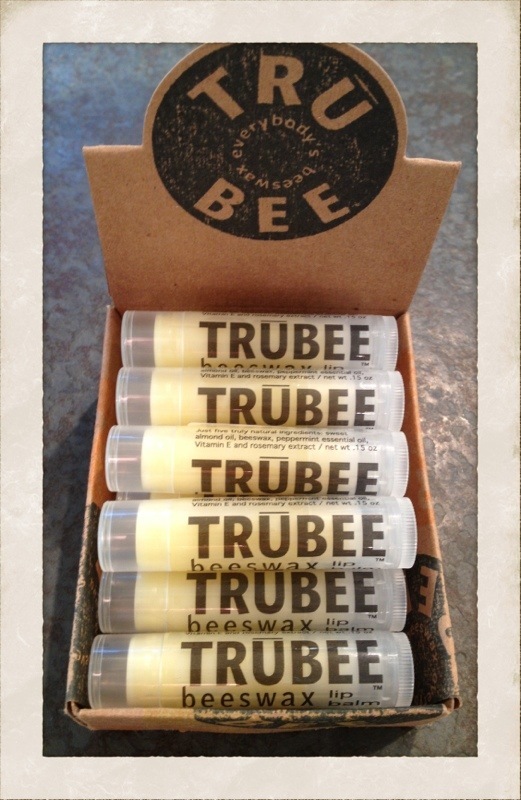 These insanely gorgeous beeswax dipped TruBee honey bottles arrived the other day. So good they almost make me weep. By now, you all know how excited stuff like this gets me. I love selling beautiful things, and this most certainly goes very close to the top of the list. 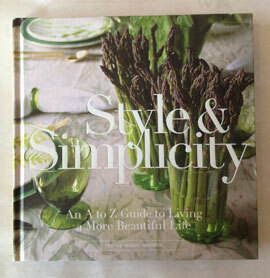 Perfect to take as a host/hostess gift instead of a bottle of vino. Just think of all the enjoyment the recipient will get from having this usable object out on the counter and looking at it with a smile and thinking of you, the giver. 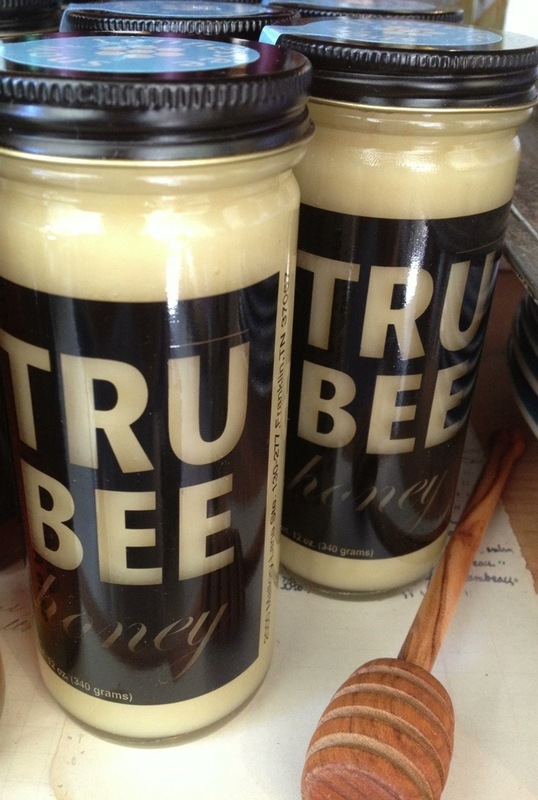 Each bottle of TruBee honey captures the essence of nature in a particular place and time. Given changes in rainfall, sunshine and bloom time, each vintage is unique. Full of nuance, this 100% pure honey is raw and harvested by American beekeepers focusing on indigenous, sustainable nectar sources that are healthy for honeybees. 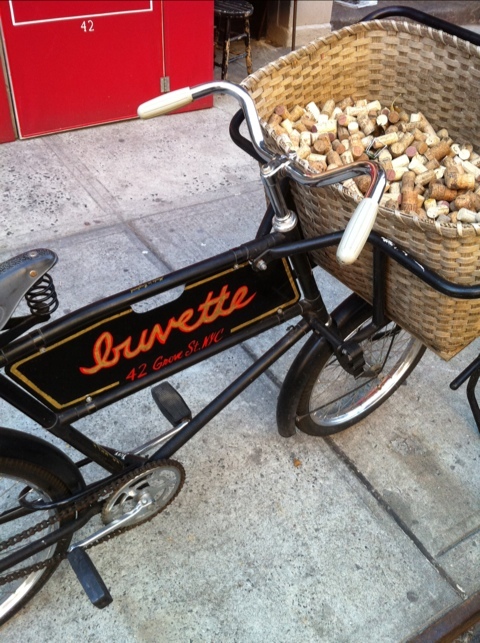 Definitely what is in the bottle is every bit as sublime as the bottle. Plain and simple, all good stuff. 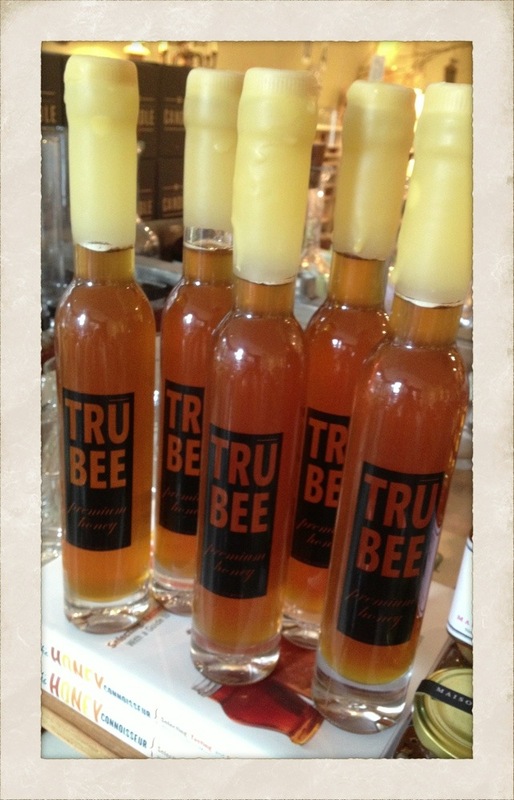 From the fab TRU BEE folks, comes Tennessee Snow honey. 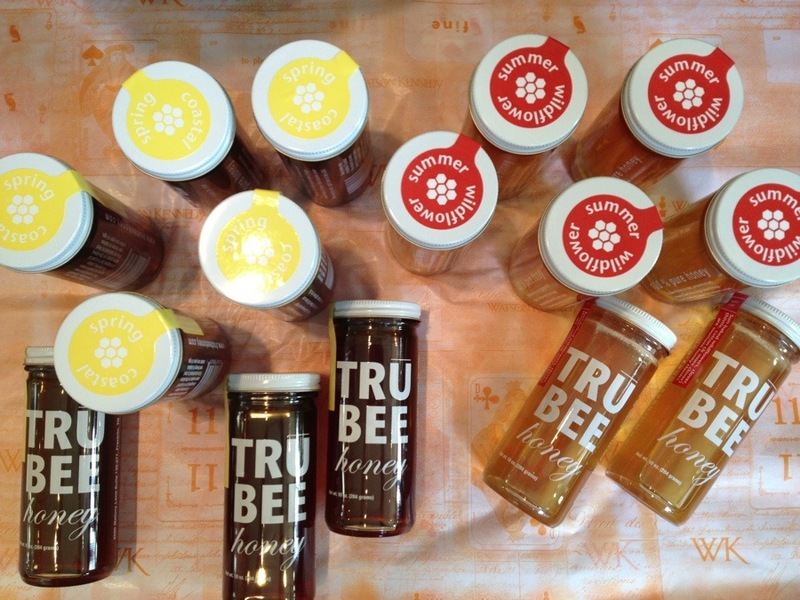 It is raw, unprocessed, non-pasteurized honey–with all the healthful enzymes and pollens intact. I find the creamy white color to be so intriguing, as it is not what you see in honey often. This is perfect spread on morning toast. I also love the idea of a bottle of this set out with a cheese platter. The spiffy graphic bottle makes this ideal for gift giving. Good, and good for you. 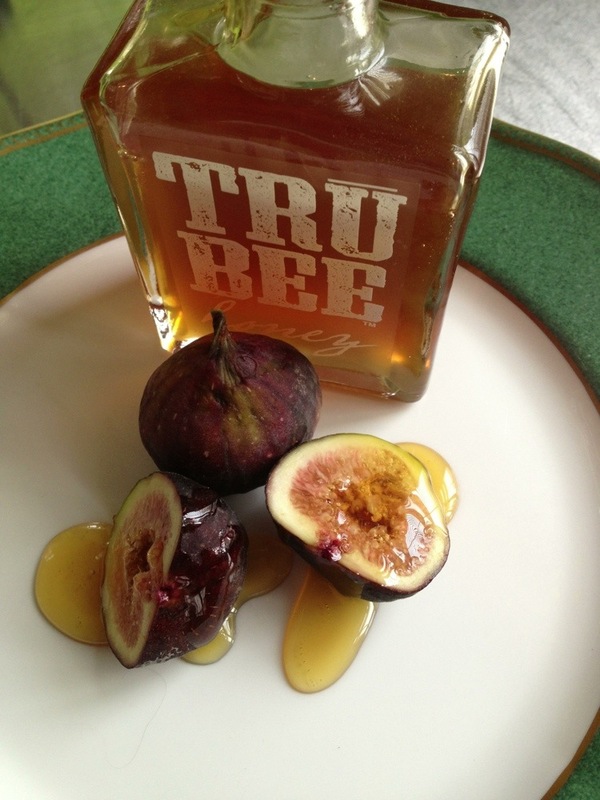 Good honey can be a bit like a good wine, layered with subtle complexities of flavor. The flavor also varies depending on what the bees feasted on that particular season. That brings us to TRU BEE. Each jar of this honey captures the taste of nature in a particular place and time. Rainfall, sunshine, bloom time–all take part in the unique taste of each harvest. That flavor may never be repeated again. Our order of the honey just arrived the other day. What I like is that it is bottled & labeled by the season harvested. The Spring honey is full of nectar from fruit trees. The honeybees making this vintage also foraged crimson clover and wild country privet. The Summer variety is deeper in flavor, from sun-drenched wildflowers and herbs, such as lavender & rosemary. Yum. A taste of the seasons from Tennessee. I also love the lip balm they produce. Made from unbleached beeswax, sweet almond oil, peppermint essential oil, vitamin E and rosemary extract. Again, yum. All housed in a nifty clear container. 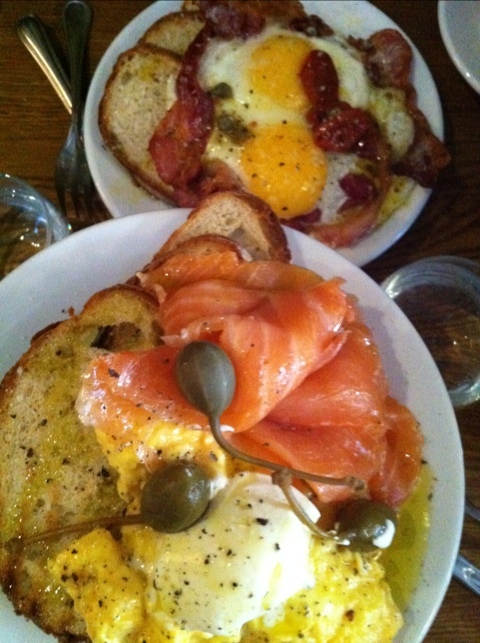 My oh my, was I in culinary & design detail heaven yesterday morning. 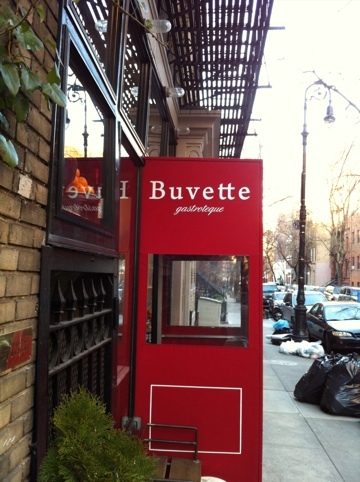 Those are not 2 things that always go hand and hand, but at Buvette, our new favorite find in NYC, they most certainly do. In the West Village, at 42 Grove Street, between Bleecker & Bedford, this tiny space is big on flavor and design detail. Truly, I was a bit weak in the knees at how good both aspects were. We arrived a minute or so before 8 when they open during the week for breakfast. They were incredibly gracious about having us come in and finding a spot even before they were really open. It was fun to watch the theater of it all unfold, as a new day began in the beyond charming space. Water was poured from cool vintage looking apothecary bottles. I took a few photos for the post today, and then the culinary experience began. As most of you know, I love small, intimate, cozy spaces. 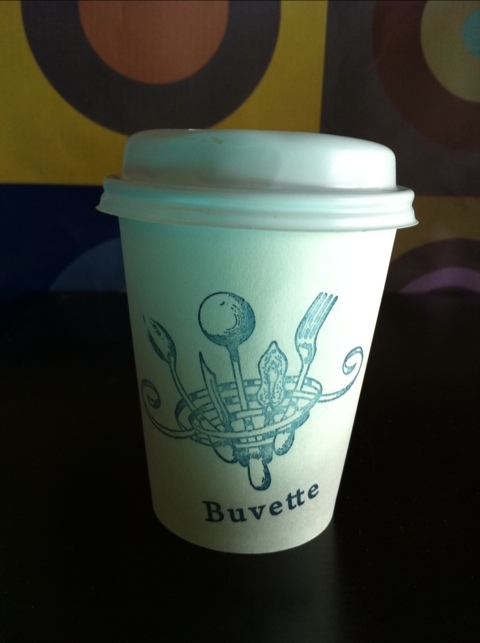 Buvette is all of that in spades. The tiny table becomes this artful tableau once drink and food starts arriving. There was not one bite, morsel or sip that did not satisfy completely. 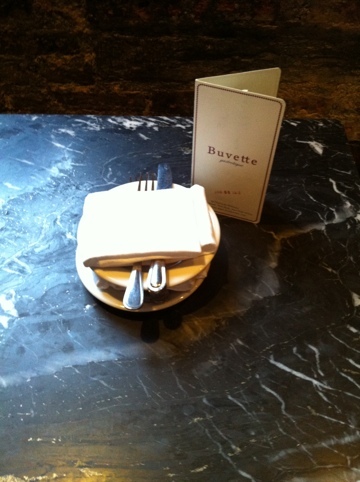 Dishes are delivered on vintage compotes, so the food is at varying heights at your table. Owner/chef Jody Williams arrived as we were enjoying our meal. Cheers to you Jody for creating a culinary work of art! 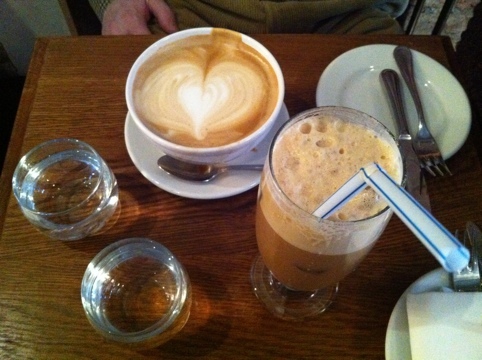 We love frequenting eateries that are individually owned, where you really see the passion of the owner shine. 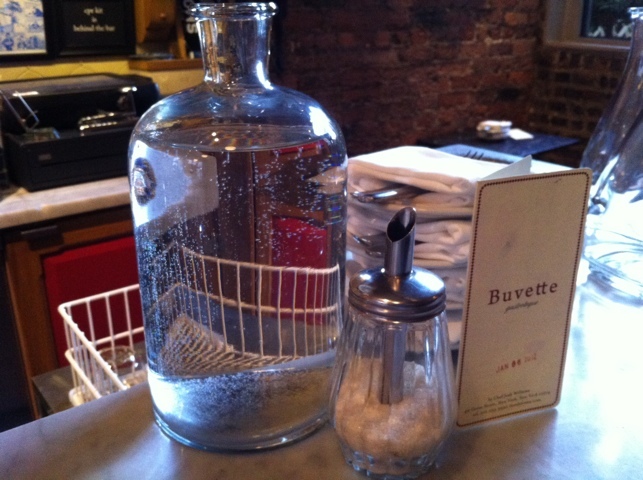 Buvette is that type of place. I look so forward to frequenting it on each of my visits.